Neon Cluster Wins targets the growing army of players who enjoy quality classic casino entertainment dressed in a modern fashion and brings more than interesting bonus options. Moreover, the game changes traditional approach with standard winning lines and combinations of 3 or more symbols of the same kind requested for a payout. Instead, you’ll have to make Cluster Swirls of 10+ symbols and hopefully land a big win of 15.000 coins. Find out more details in the Neon Cluster Wins slot review. Want to see how Neon Cluster Wins works? Select a recommended casino site from the list below and start playing for free or real – our screenshots will give you a sneak peek! This is a highly animated slot machine with neon-glowing icons where Joker transforms all other symbols on the reels into matching and thus helps you form a cluster. Shiny Star acts as the Wild and improves a payline or replaces a symbol missing from a winning combination. At any random spin throughout the main course, lucky winners will get the layout improved with Extra Wilds with a guaranteed win on any spin where it’s triggered. Naturally, you can play for fun or for real money, depending on your preferences and ambitions. If interested to get some demo credits to help you learn how to win, press the Neon Cluster Wins Free Play before the reels start spinning. In terms of the gameplay, we already stated you have to form a cluster of at least 10 matching symbols and look the paytable for a corresponding prize. Moreover, the Cluster Swirl feature to make cluster combinations even bigger. 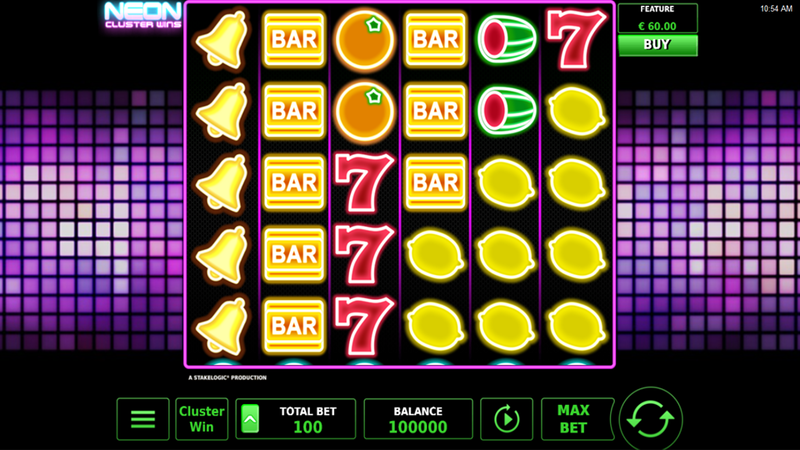 Speaking of which, players with a cluster of 30+ Bars will score the Neon Cluster Wins Bonus prize of 15.000 coins, while Sevens and Bells respectively pay 10.000 and 7.500 coins as symbols with a higher payout rating than classic fruits. On the other side, neon-glowing Melons, Plums, Oranges, Lemons, and Cherries pay between 7.500 and 20 coins for clusters of 10 to 30 or more matching icons. Finally, the coin value goes from €0.01 to €0.50, so you can wager between €0.10 and €50 od 1 to 10 levels, according to your betting strategy. With the Neon Cluster Wins Bonus icons, you can activate the Neon Cluster Wins Free Spins as well as the Extra Free Spins mode. During this round, you will get 2 additional rows and improve your winning odds. Thanks to the Buy Feature, you can actually buy some extra spins during the base game, presuming your bankroll has what it takes to support this action. Special Discount Coins may appear and award a discounted price for your planned purchase. Play online on Stakelogic-powered sites using any modern mobile device as there is no need to download the iPhone app or the Android .apk file. 3. What is the RTP factor of Neon Cluster Wins? The Neon Cluster Wins recension sticks to the official RTP info of 95.77%. With a maximum winning potential of €162.500, this is the title is recommended to players of all experience levels, where both newbies and high rollers alike will be tempted by this attractive jackpot. We suggest you try the Neon Cluster Wins tips and use them to bring the house down since the starting advantage is something you’ll struggle to beat.